If you stop by this page from time to time, you will notice that there has been precious little writing happening lately. My last few posts focused on our U.S. sojourn to visit family and friends and sell olive oil. Oh, and I hinted at our (then) upcoming adventure in which we proposed to walk 500 miles across northern Spain, joining thousands of modern-day pilgrims on the road to Santiago de Compostela. No one was more surprised than me when we actually did complete the Camino on June 4th after 32 exhilarating, wearying and often emotional days on foot. 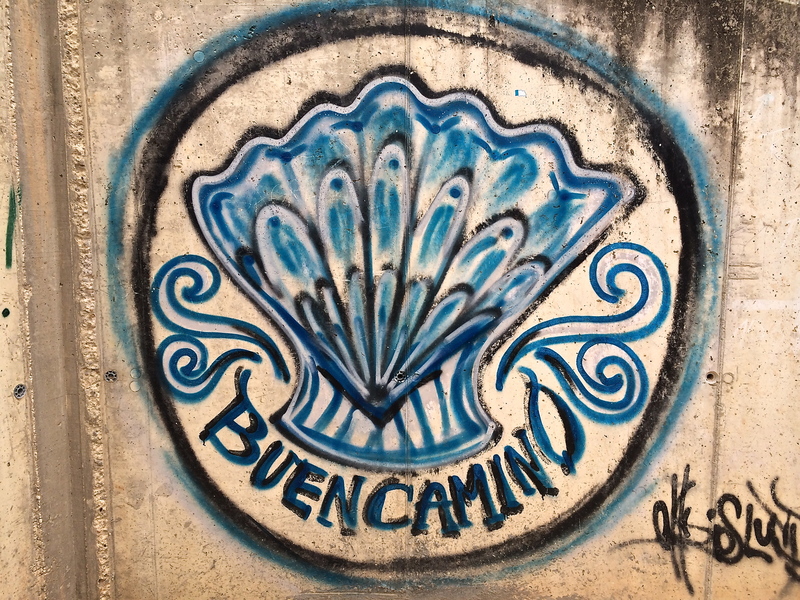 The scallop shell, long a symbol associated with St. James, appears everywhere on the Camino. The shell’s lines radiating outward represent the various pilgrimage routes throughout Europe that converge on Santiago de Compostela. 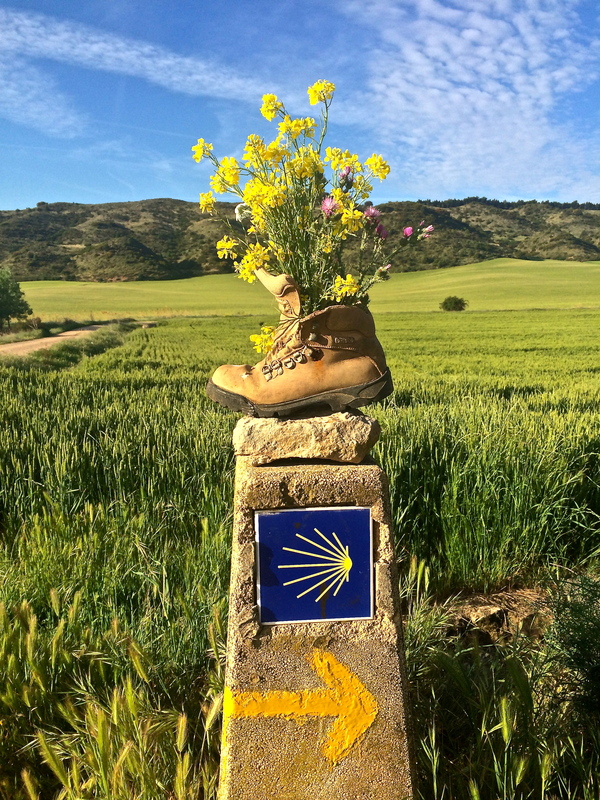 The Camino Francés is the most traveled of all the St. James pilgrimage routes. Over 160,000 pilgrims from all over the world make their way along its paths each year. 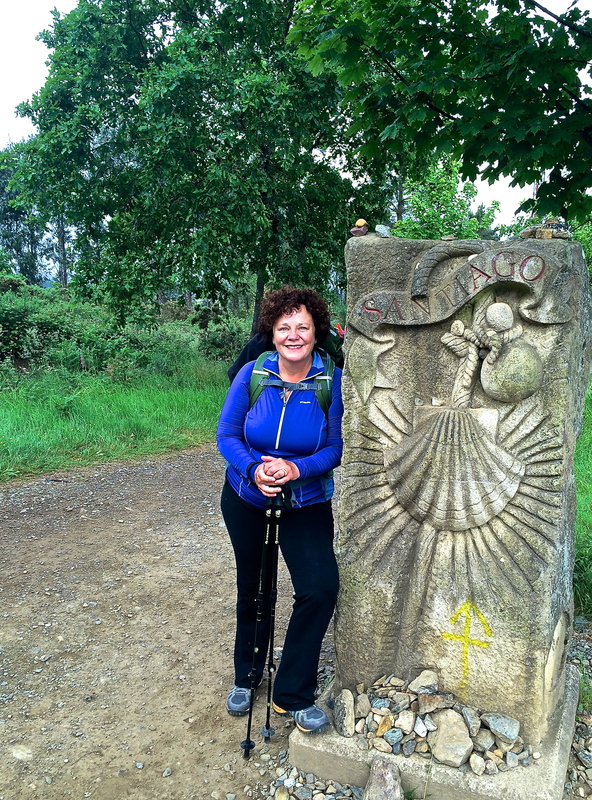 Like some 25,000 others, our Camino began on May 3rd in St. Jean Pied-de-Port in France. Later, we learned that only about a third of these pilgrims make it all the way to Santiago de Compostela. In retrospect, I am especially pleased that I knew nothing of this depressing statistic before we set out from France on that rainy, windy day in May. 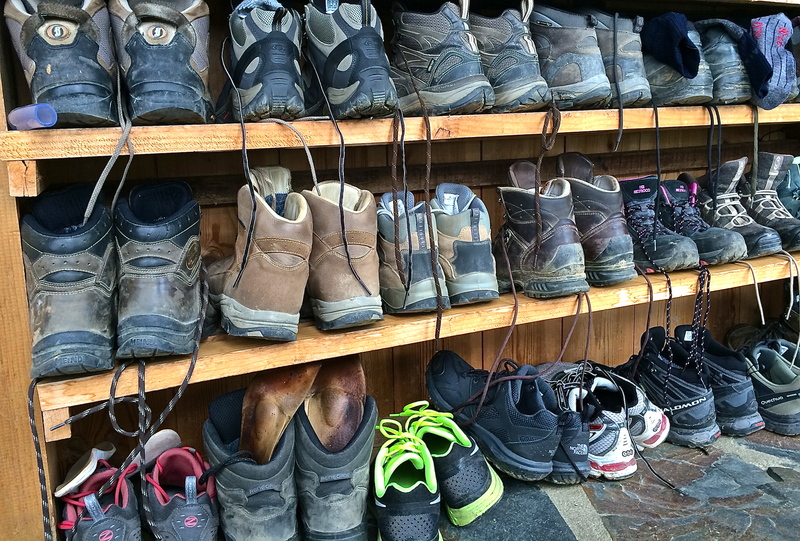 Every hostel (called albergues) on the Camino shared the same characteristics: lots of boots, backpacks and bunk beds. Oh, and snoring pilgrims. filled with bunk beds reminiscent of a Spartan, 1950s-era summer camp. Oh, the snoring! Some people are interested in the food: What was it like? When did we eat? Italians especially want to know if there was pasta and are convinced that it must have been substandard (It was.) Most everyone worried about our physical selves, sure that we must have suffered serial blisters and crippling tendonitis. Only a few are curious about what we were thinking during those long, lonely stretches of trail and whether or not we experienced some sort of revealed truth or life-changing epiphany. So in an effort to make sense of our experience post-walk, here are my top ten thoughts about our long trek across Spain. 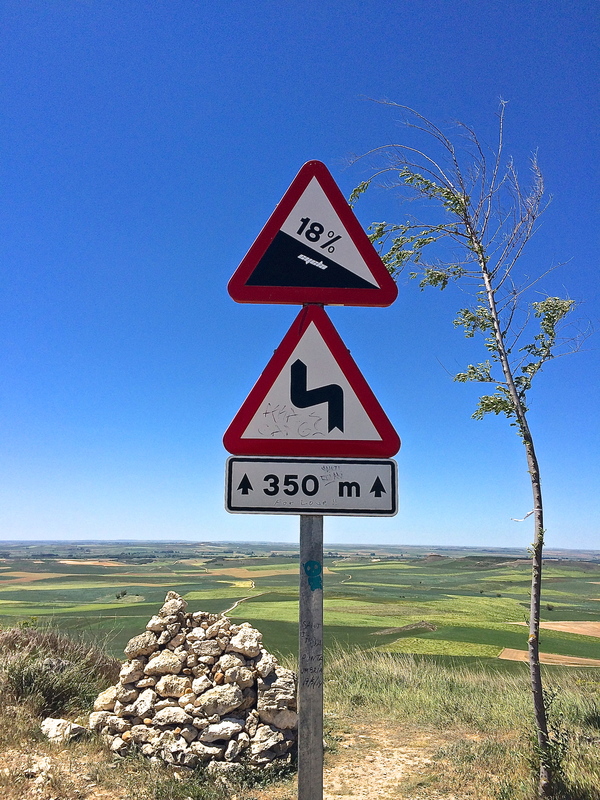 We were surprised (horrified) to find that there were significant grades on the meseta, the part of the Camino advertised as flat and boring. lots of rivers, streams, creeks and irrigation canals, all of which required crossing. We walked in May and early June, so the weather was as capricious as you might imagine: gentle breezes, relentless downpours, 30 mph winds, strong sun and, yes, snow. Sometimes on the same day. But all of this is secondary to the moment we realized that we would be walking day after day after day and there would be hills. So many hills. 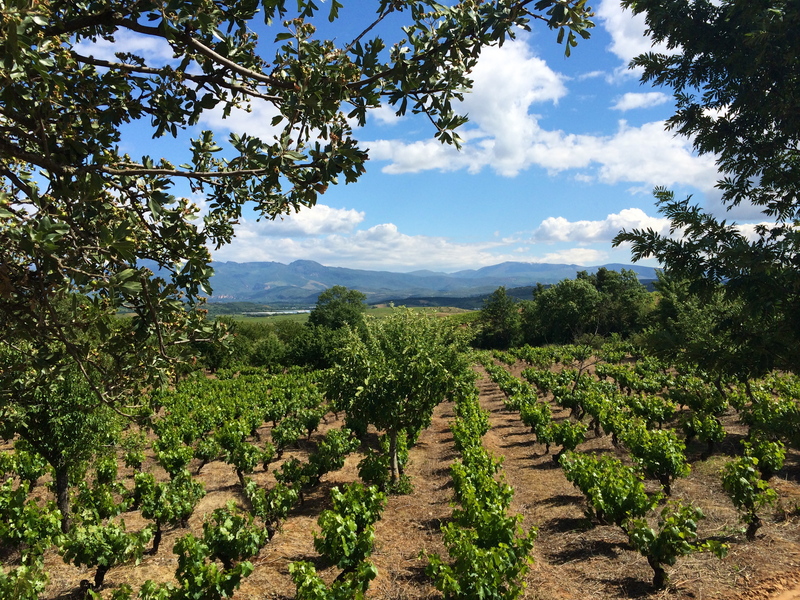 Bierzo is a region known for its mencia, a beautiful grape that makes light fragrant and increasingly complex reds. 2) The cities, towns and especially the countryside in Spain are heartstoppingly beautiful. From the Pyrenees to the green hills of Galicia, Spain’s natural beauty and its built environment absolutely knocked us out. High mountain passes and lush alpine meadows melted into endless plains of grapevines, wheat and other crops along the Camino. Birch forests, swiftly flowing streams and sheep-filled pastures through much of the first third of the walk made us happy to be alive. Small towns were charming, especially when they offered a bar for our many café con leche breaks. Large towns (Pamplona, Logrono, Burgos, Leon and Ponferrada) offered a harmonious melding of medieval and contemporary architecture, by turns evocative of past civilizations and yet more contemporary than many other European cities we know. We were stunned to find that there is almost no garbage strewn about the roads of northern Spain (Italy, are you listening?) What little trash we found was clearly pilgrim detritus in the form of discarded water bottles, snack food wrappers and Band-Aid tabs. This little village sits on the mountain border of Galicia, Spain’s hauntingly beautiful green province in the northwest of the country. Pascal, our Dutch walking companion, epitomized what we like about his people: warm, gregarious, kind and very, very fun. 3) Our walking companions were as varied as the Spanish topography, which is incredibly diverse. From Catholic priests to Buddhist hippies, retired attorneys to college students, farmers to engineers, surfers to golfers, the Camino summons a cross section of humanity. We met Australians, Koreans, Italians, Spaniards, Canadians, Puerto Ricans, Brazilians, the Dutch, the French and Germans. Our common purpose seemed to erode communication barriers, but in a strange way, cultural differences were oddly accentuated in the hermetic bubble of our existence as we walked. Risking cultural stereotyping, we found that the Germans were well prepared, the French a little insular, the Italians gregarious, the Australians easy going and the Dutch especially fun. Canadians were easy to spot. Every Canadian we met had affixed an outsized Canadian flag to their backpacks, probably to avoid being misidentified as a denizen of the lower 48. And Americans (the U.S. kind) were, well, louder than most everyone else. If nothing else, we learned all kinds of great slang. Who knew that a coffee break in Queensland is called a smoke-o? When we finished walking for the day, we found the nearest bar to investigate the lunch or dinner possibilities. This was a good one. road, stop for café con leche and a bocadillo in a bar, walk some more, stop for lunch (chorizo, cheese, fruit, nuts), walk some more, stop to take our shoes and socks off, walk again, then arrive at our stopping point for the night. Our existence was reduced to the basics, so small comforts became incredibly important. Post-walk showers were a moment in heaven, no matter how utilitarian the setting. A beer on the terrace of the pilgrim hostel was a sumptuous reward. And it almost didn’t matter what we ate for dinner; we were just so thrilled that someone else had prepared it. Towards the end of the walk, we found that we had hidden energy reserves, so we were able to explore more and stay up until at least 9:30 p.m. A little pathetic, but true. I was easily recognizable on the Camino. I pretty much wore this shirt on the trail every single day. Yes, there was a lot of hand washing. 5) Correlated to 4) above, the longer we walked, the less we needed. 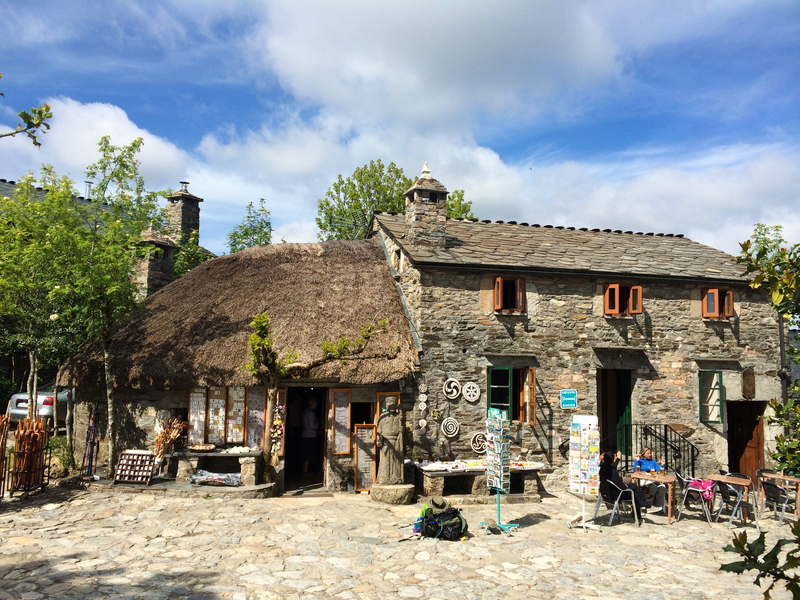 After the first four days of walking, we performed a triage on our backpacks and sent ahead all but the truly most essential items to the general delivery post office in Santiago for collection at the end of the Camino. Although we’d read that every single ounce makes a huge difference in terms of pack weight, it took the grueling climb over the Pyrenees to fully appreciate this truth. By the end of the first week, we knew exactly what we were carrying and where to find it in our packs. It took us about 10 minutes each morning to wake up, pack up and leave the hostel. Were we utterly sick of our clothes? Absolutely, but don’t underestimate the value of identifying your new friends by what they’re wearing on the trail. It’s easy—they’ve got on the exact same thing every single day. 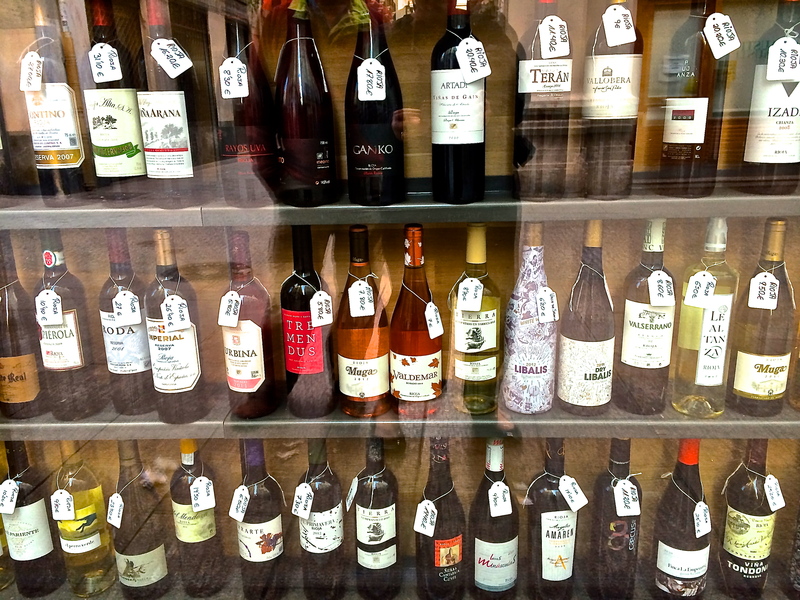 Just a small selection of wine from Rioja in Logrono, one of our favorites along the Camino. 6) The wine is Spain is extraordinary at every price level. From Rioja’s tempranillo to Galicia’s mencia, the wines we tasted went from strength to strength. 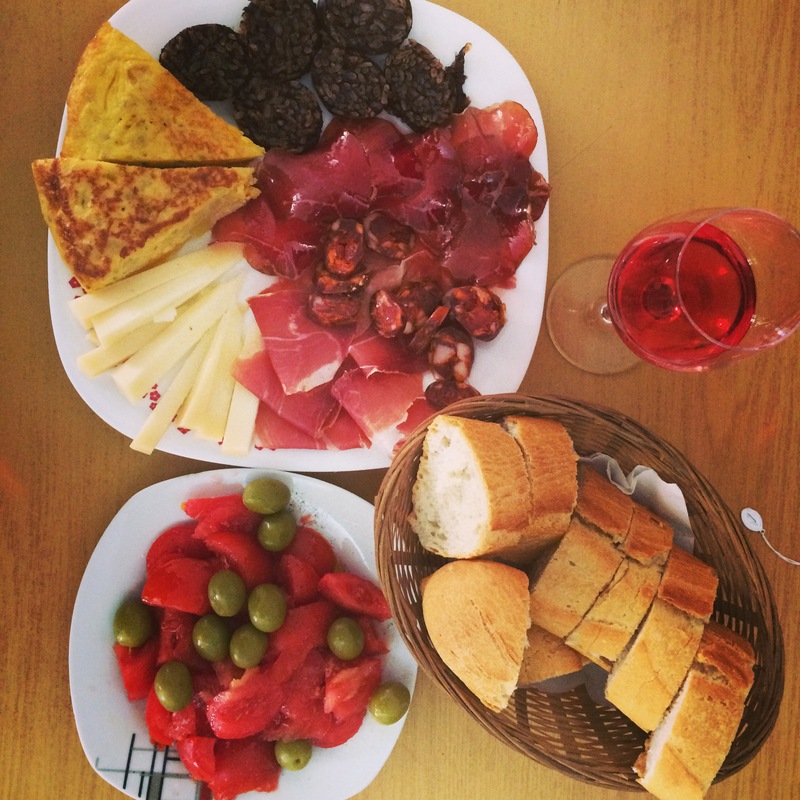 And the practice of offering a free tapa with every glass of wine purchased made dinner superfluous. We rarely missed an opportunity to (ahem) further our knowledge of Spanish wine and are comforted by the certainty that there is so much more to learn. 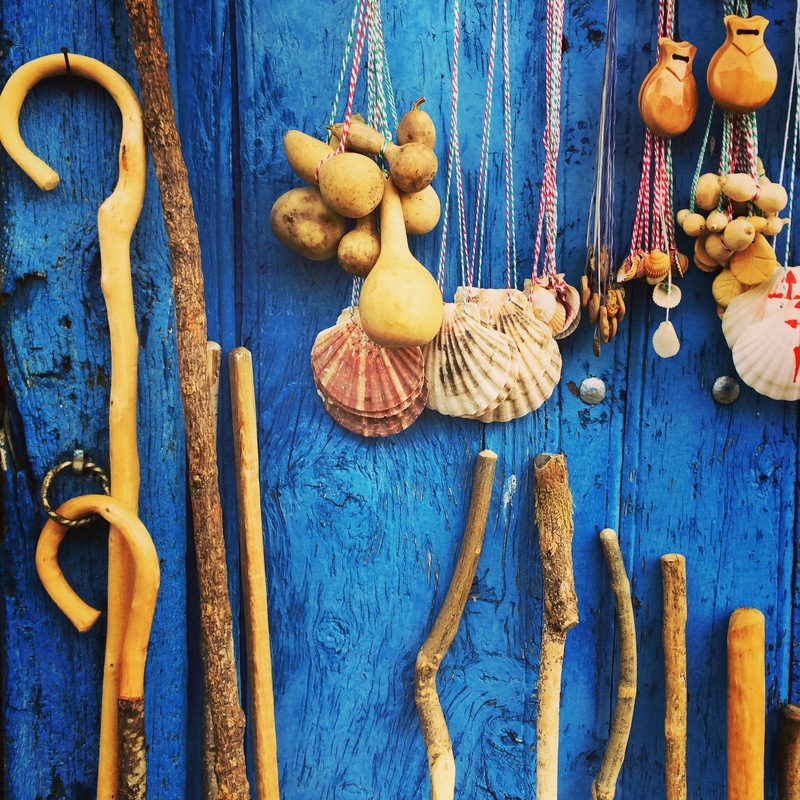 Iconic accessories for the Camino are found everywhere along the Way, but not everyone who carries them has spirituality or piety on their mind. wanted to know when people left in the morning, how many kilometers they walked and whether or not they indulged in rest stops. Bicigrinos—those poor unfortunates who choose to engender the wrath of the walkers by completing the Camino on bikes—were always good for negative fodder. Others made a point of stopping in every church along the trail, expressing concern that we had missed a few (hundred). And then there was the medical advice . . . So many fellow walkers were convinced their well-tested blister remedies were the most effective and really, really wanted to tell us all about them. We learned to smile, nod and keep walking or, if necessary, duck off the trail for yet another café con leche at the nearest bar. Ferrino ponchos saved our bacon more than a few times on the Camino. 8) Good to know: rain ponchos beat rain jackets; waterproof shoes beat Gore-Tex; Merino wool beats Coolmax; Aquarius (a Spanish electrolyte replacement drink) beats Powerade; Crocs beat Keen sandals; and nothing is better than a very light backpack and glass of vino rosado at the end of the day. 9) The pace of walking is a revelation. Very little passes you by as you walk, from the rabbit poking his head out from behind a grapevine to the way the sunlight hits a stream as you cross over it on a rock bridge. I am not ashamed to admit that I took 1,842 photos. I could have taken so many more. 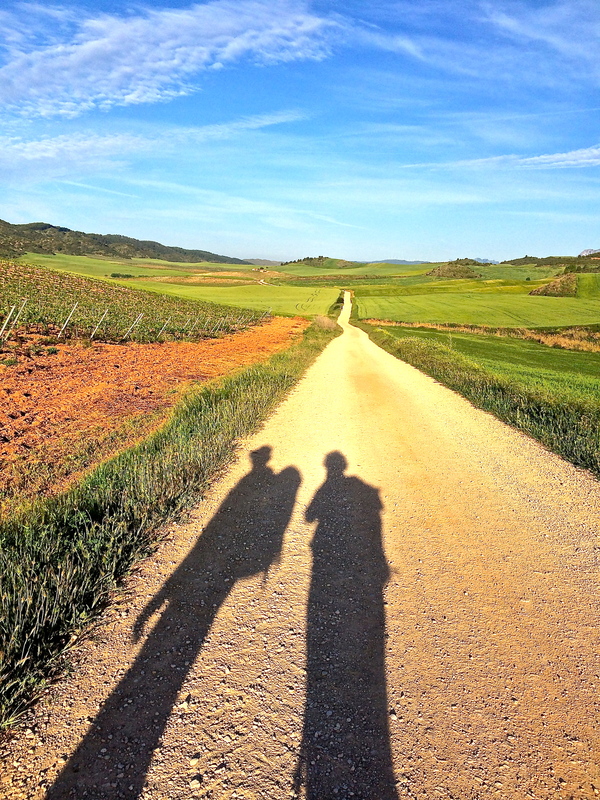 Our shadows were our frequent companions every morning on the Camino. fifth day, it became abundantly clear that I could only think about the fifth day. And by the third week, I wasn’t really thinking about anything at all. Instead, there were moments when I was filled with joy as we walked through vineyards, smiled at farmers and stopped to put our feet up. It’s been a few weeks since we left Spain, returning to our little corner of Italy in Martina Franca to find summer in full swing. We’re still brimming over about our time on the Camino, trying to live something like we did on the trail. We know that something has changed for us forever. When I figure out exactly what it is, I’ll be sure to let you know. Unexpected inspiration pops up everywhere on the Camino. Wonderful account, Catherine. Very comprehensive, very well put, very informative. As usual! However, this was of special interest after having recently seen the film “Walking the Camino” by Lydia Smith. In general though, I love hearing about your European life. (Cont’d.) the Lydia Smith documentary when we were in Santa Cruz before we returned to start the Camino. We appreciated the reality presented in “Walking the Camino” (particularly compared to Martin Sheen’s “The Way,” which we liked for different reasons. It was a unique experience . . . Truly incredible. 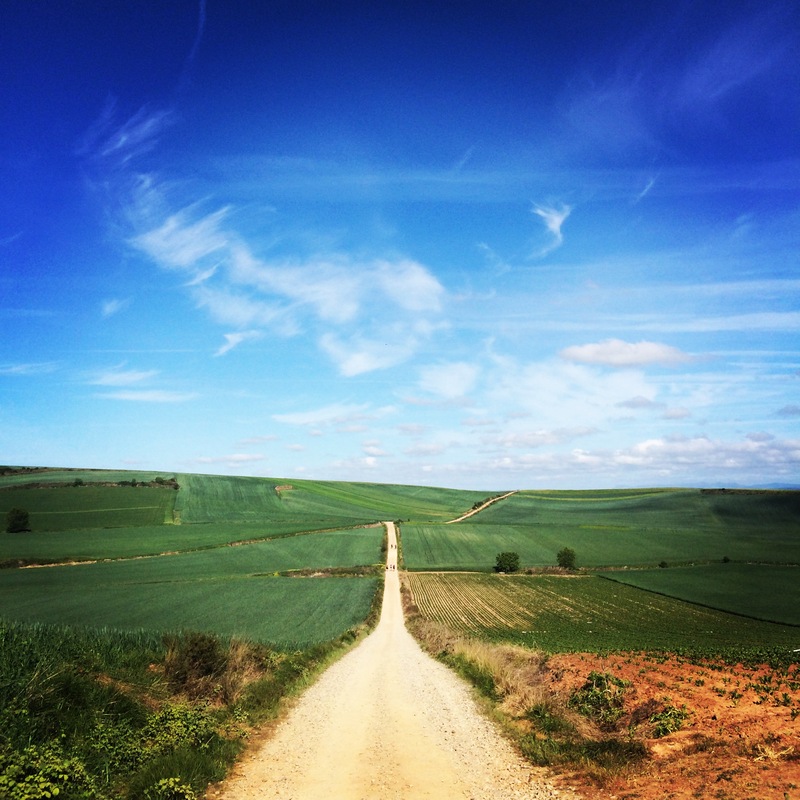 We’re now thinking about trying the Via de la Plata, the Camino route that starts in Seville and travels through Extremadura and La Mancha to reach Santiago. It’s a long one–over 1,000 kilometers–but we’re considering bicycles this time around! Thanks, Cory! Coming from you (my organization idol), this is high praise. I hear from Rolando, lovely Rolando, that he also went. Were you together? He must have had an easier time of it with those splendid long legs of his! Julia, Rolando was about two weeks ahead of us since he started his Camino in Leon right around the time we started in St. Jean Pied-de-Port. We messaged one another on the trail, which was great for us because he gave us lovely food tips (the pulpo in Melide, for example). 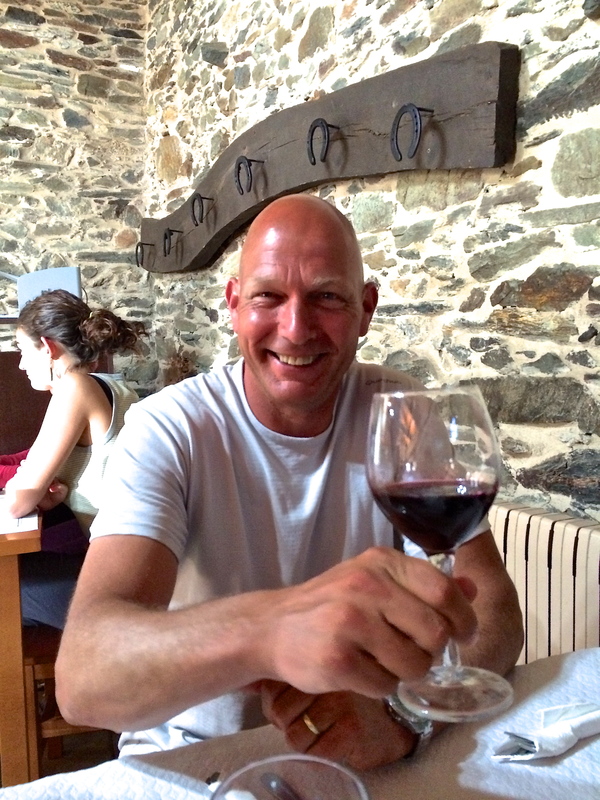 I think he loved his experience and would like to do the longer Camino at some point. And yes, I envied him his stride!